As the specialists in bakery and bread supply in the North West, we’re passionate about bread and we want to make sure that everyone gets the full benefit of our products. Many of us buy too much bread and are unable to use it all up before the use by date, but bread still makes a fantastic ingredient even when it is past its best. Here are some great ideas for ways to use up those leftover baked goods. – Stale bread is great for making breadcrumbs, which can be used in all kinds of recipes and stored in the freezer until you need them. Simply put your stale bread through the food processer and you have a ready supply of breadcrumbs to coat meat and fish, scatter over pasta dishes, make a crust for casseroles, and add to countless other dishes for texture and crunch. – Croutons are an easy way to use up bread while adding a new dimension of flavour and texture to soups and salads. Simply cut your bread up into cubes or chunks and sautee them in some oil and seasoning of your choice, until they are crisp and golden brown. – Leftover bread can also be used in sweet dishes, particularly in puddings. Why not try a classic bread pudding made with eggs, sugar and mixed fruit, or a summer pudding packed with berries? Preheat oven to 190 C / Gas mark 5. Lightly grease a baking dish. Butter 5 slices of bread, cut in half. Layer the bread in the dish adding a handful of sultanas and the sugar mix as you go, covering each slice. Mix the milk and eggs together and whisk. Pour over the bread and leave to absorb for 10 minutes. Bake in the oven for 35 to 45 minutes, until the pudding is set and browned. 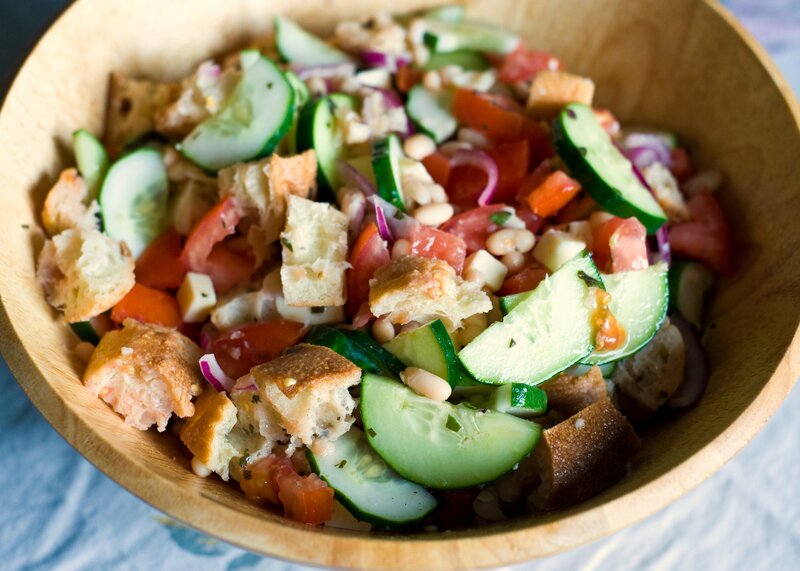 – Bread can be used as an ingredient in salads. One of the most famous bread salads is panzanella, an Italian recipe which traditionally incorporates chunks of bread and tomatoes soaked in olive oil and vinegar and flavoured with herbs. This recipe actually works much better with stale bread than fresh, as it holds its structure better after being soaked in the dressing. Tear the stale bread into rough 3cm pieces and place on a tray. Place the tomatoes in a bowl and season with salt and pepper. Rinse the capers, squeezing out any excess liquid and add to the bowl, along with the onion, peppers, bread and anchovies, if using. Toss the mixture together with your hands, then stir in 2 tablespoons of vinegar and about 3 times as much extra virgin olive oil. Taste and add a little more salt, pepper, vinegar or oil, if needed. Tear in the basil leaves, stir together and serve. Delicious with barbecued meats or roast chicken.